SEATTLE — Salmon swim through Charlene Krise's earliest memories: streams so dense with fish she couldn't see the bottom, salmon roe for breakfast and salmon fish head stew for dinner. "My father said that, as an infant, instead of having a teething ring, we all had smoked salmon for our teeth," said Krise, who's vice chairwoman of the Squaxin Island Tribal Council near here. Like many in her tribe, whose members are called "people of the water," Krise spent most of her adult life fishing off northwest Washington. But in the 1990s, salmon populations in the Pacific Northwest declined dramatically. There were times, Krise said, when "not one of us could find the salmon." "It felt like the whole world was in the negative because there was no salmon," the soft-spoken Krise said. There are many reasons salmon populations have fallen off in northwest Washington: water pollution, overfishing, dam construction and climate change. But tribes around Puget Sound point to the state's construction of culverts — tunnels that channel water under roadways — that keep salmon from reaching habitat upstream. Tomorrow, the tribes will go to the Supreme Court to ask justices to uphold a 2013 court injunction ordering the state to fix hundreds of culverts that are blocking salmon from accessing upstream habitat. The 9th U.S. Circuit Court of Appeals upheld the order, but Washington state is appealing, arguing the injunction is expensive and too broad in scope. "It's very worrisome thinking about the future and the growth of the area," Krise said. "If we don't have set policies to protect those streams for fish passage with the culverts, we are going to be in trouble for the future." Culverts are only the latest focal point in a decadeslong legal war between Northwest tribes and Washington over treaties signed in 1854 and 1855. Washington territory's first governor, Isaac Ingalls Stevens, negotiated the treaties between white settlers who had been lured by the West's magnificent forests and the area's native inhabitants. Tribes agreed to give up some 64 million acres and in return received "the right of taking fish, at all usual and accustomed grounds and stations ... in common with citizens of the Territory." But after the Stevens treaties, the Pacific Northwest's white settlers impeded tribal access to fishing locations in the Columbia River and Puget Sound. That led to court clashes, beginning with an 1884 case over a settler's efforts to deny Yakima tribal fishers access to their fishing grounds. The culverts case itself is several decades old. Its origin is a lawsuit that coincided with acts of civil disobedience that tribes undertook during the 1960s and '70s to uphold their treaty rights. Tribal members — later joined by celebrities — were arrested as they returned to their traditional fishing grounds in staged "fish-ins." Tribal environmental advocate Billy Frank Jr., who later received a posthumous Presidential Medal of Freedom, was arrested more than 50 times. The "fish wars" culminated with the United States and Northwest tribes suing Washington in 1970. The federal government asked the court to find that the treaties guaranteed tribes a fair amount of fish, that the tribe's share included hatchery fish and that the state is required to maintain the habitat necessary to provide protection for salmon runs. "Our elders, they fought to get into the federal court," said Phil Hamilton, vice chairman of the Muckleshoot Fisheries Commission. "It was a time where different tribes were having their fish-ins and every tribe was trying to get into the federal courts, because if they could get into the federal courts, they knew they could get the help that they needed." The tribes secured a major victory in 1974, when the late Judge George Hugo Boldt of the U.S. District Court for the Western District of Washington ruled that they have the right to act as co-managers of salmon and harvest them in accordance with the treaties. The state of Washington, however, resisted Boldt's ruling. After five more years of legal wrangling, the Supreme Court in 1979 ruled that tribes have a right to a "fair share of available fish" or up to half of each salmon run. Boldt, who died in 1984, didn't get to the questions of whether the tribes have a right to hatchery fish and salmon habitat free of environmental degradation. Those questions were left for later courts. In an en banc ruling in 1985, of which Supreme Court Justice Anthony Kennedy was a part, the 9th Circuit affirmed a lower-court decision that hatchery fish must be included when determining the share of fish to tribes. But it punted on the habitat question. "The tribes asked for declaratory relief — a declaration that the treaties protected habitat — and the 9th Circuit said, well, we don't really think it's a good idea for courts to opine on this issue unless we have a specific factual dispute," said Michael Blumm, a professor at Lewis & Clark Law School. "And it took the tribes awhile to come up with something that's unique to the state," he said. The state began building culverts in the early 1900s as it began participating in the federal highway program. 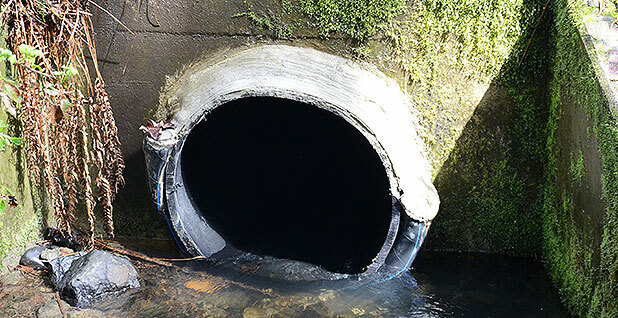 Culverts come in many forms — from concrete boxes to corrugated metal pipes — all with the purpose of funneling a stream under a road. There are whole networks of culverts under the greater Seattle area, many invisible to drivers. "It's pretty common in these urbanized areas to just find somebody put a stream into a pipe and somebody else thinks that's a pretty good idea so they tack one onto it," said Paul Wagner, biology branch manager at the Washington Department of Transportation. "We've got some where streams will flow for 1,000 feet or more through culverts, and probably a lot of people in their day-to-day business don't even think there's a stream under there. They'll go under buildings, under schools, under shopping centers." Many culverts, though, were built too small or have since become otherwise blocked. High-velocity flows have carved out the streambed beneath their openings, creating steep drops of water several feet high. In others, the water depth is very shallow along the bottom of the culvert. They all create obstacles for salmon that cross streams at different stages of life. The fish use the streams in different ways, but generally, adults need to travel upstream from the ocean to spawn in gravel-covered streambeds. The farther upstream they get, the more likely their offspring will survive because they're away from predators. Juvenile salmon then remain in streams early in life, seeking out protected pools of slow-moving water. If a culvert is blocked — or the water depth through too low or the velocity of the flow too high — somewhere along a stream, it impedes the movement of salmon at both adult and juvenile stages. "It's not only that they can't get home but that it forces much more competition. It really restricts the area that they can live in," said Larry Wasserman, environmental services director for the Swinomish Indian Tribal Community. For adults, culverts are considered blocked if the water depth is less than 10 inches or the velocity is greater than about 4 feet per second; juveniles typically cannot leap over barriers greater than around 10 inches or swim in velocities greater than 2 feet per second. Not all culverts, though, are total barriers to fish. "Some fish might get through sometimes. It might depend on hydrologic conditions, the stream flows and such. They might have to wait for a more opportunistic time to pass through the culvert," said Susan Kanzler, stream restoration program manager at the Washington DOT. But even for adult salmon that make it through barrier culverts to spawn, putting the effort into getting through can lower their fitness, making it more difficult for them to get back to the ocean. "They're just physically beat up. You'll see some of the times they'll be coming back and they're all scraped up," Wagner said. "They've been through the gauntlet." In the 1990s, as scientists learned more about the needs of salmon and commercially harvestable levels declined, Washington recognized that culverts posed a threat to salmon. 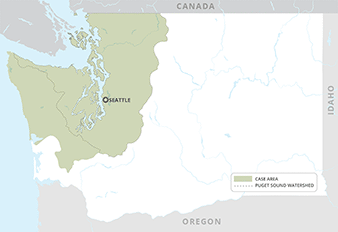 In 1997, the Washington State Legislature established a Fish Passage Task Force, and state agencies issued a report identifying barrier culverts as "one of the most recurrent and correctable obstacles to healthy salmonid stocks in Washington." But in 2001, the federal government and 21 tribes again sued the state, this time claiming that the state's management of its culverts violated the 1850s-era treaty rights. 1970 The United States and tribes sue Washington, alleging the state has violated tribal fishing rights secured by 1850s-era treaties. 1974 The late District Judge George Hugo Boldt finds tribes have the right to act as co-managers of salmon and to harvest them in accordance with the treaties. 1979 The Supreme Court rules tribes have a right to a “fair share of available fish,” up to half of each salmon run. 1985 In an en banc decision, the 9th Circuit affirms hatchery fish must be included in a tribe’s fair share. 2001 The United States and tribes initiate the culvert phase of the litigation, arguing Washington has a duty to preserve salmon runs and habitat. 2007 District Judge Ricardo Martinez holds that Washington’s management of culverts has diminished the size of salmon runs. 2013 Martinez issues a permanent injunction ordering the state to repair or replace culverts that bar fish passage. 2016 The 9th Circuit affirms Martinez’s rulings, leaving in place the 2013 injunction. The court later denies rehearing, though several judges object. 2018 The Supreme Court agrees to hear Washington’s appeal. Oral arguments are scheduled for April 18. Judge Ricardo Martinez of the U.S. District Court for the Western District of Washington agreed in 2007, ruling that culverts have "substantially diminished" the salmon harvest. Six years later, he ordered the state to fix or repair hundreds of culverts that were blocking fish passage in its northwestern corner, including the Olympic Peninsula and the Seattle area. Martinez found the state was going too slowly in removing obstacles to salmon runs. It would take more than 100 years, he wrote, to replace significantly blocked barrier culverts. He ordered the state to fix all blocked culverts under state roads. The Washington Department of Fish & Wildlife, the Washington State Department of Natural Resources and Washington State Parks were given until Oct. 31, 2016, while the Washington DOT, which owns significantly more culverts, has until 2030. The state could defer action on culverts with less than 200 lineal meters of upstream salmon habitat until the "end of the culvert's useful life, or sooner as part of a highway project." "We've had some really fantastic runs diminished or nearly lost to these culverts," said Charles Wilkinson, a Native American law expert at the University of Colorado, Boulder. "This was the perfect case from the tribal standpoint to raise this environmental matter. The tribes spent 20 years looking for the right case." A three-judge panel of the 9th U.S. Circuit Court of Appeals upheld the injunction in 2016 and later rejected the state's petition to review the decision en banc, or in front of the whole court. Eight of the court's active judges, though, joined an unusually blunt opinion by Senior Judge Diarmuid O'Scannlain slamming their colleagues for issuing a "runaway decision" that discovering "a heretofore unknown duty" in the 19th-century treaties. The stage is now set for the Supreme Court to weigh in on tribal treaty fishing rights once again. Eight justices will hear arguments tomorrow; Kennedy has decided to sit out because of his prior involvement in the case. Wilkinson, who is writing a book on the Boldt decision, said that the case could create a ripple effect for Native American law. "Will the court, if it doesn't rule for the tribes, make law that will cut into the Boldt decision, and their own decision in 1979, too?" he asked. "Will the court backtrack on that? This is an enormous case in Indian law." Under Attorney General Bob Ferguson (D), Washington state argues that in holding that tribes must have enough fish to provide a "moderate living," the 9th Circuit recognized "a new right, broader than any previously recognized." The "untenable standard" would render illegal many past decisions, including federal dams that affect salmon runs, and make "virtually any significant future land use decision in the Pacific Northwest subject to court oversight," the state warned. Washington also told the Supreme Court that the injunction is "remarkably unfair" because the federal government specified how the state should build culverts and granted permits for their construction. And the state says it will have to spend more than $2 billion by 2030 to fix hundreds of culverts with no guarantee that they will lead to improved salmon runs. That's because the injunction applies only to the state, not private landowners or cities and counties that own culverts in the case area. A barrier culvert for an unnamed tributary to Lake Sammamish, a freshwater lake east of Seattle that's surrounded by houses tucked into lush, evergreen trees, demonstrates the state's predicament. Invisible to vehicles, the upstream end of the culvert can be reached by climbing down a steep, slippery trail from a two-lane road. It's a 3 ½-foot diameter pipe that crosses under eight lanes of a major east-west highway and city-owned roads. The pipe is 502 feet long. When the culvert caused a sinkhole in the highway last year, the state and tribes agreed on a temporary fix, the installation of a hard plastic liner that provides protection from erosion. But the liner makes it more difficult for salmon to pass because it made the hole smaller and increased the velocity of water flows in the seasonal stream. The state is designing a long-term correction to open up the 900 feet of salmon habitat above the blocked culvert, a project that DOT estimates will cost $11 million. But there are other barriers upstream. 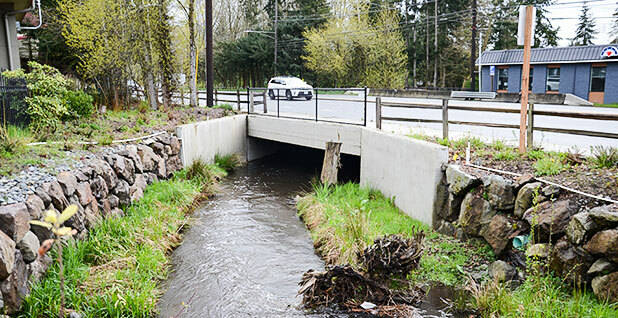 The city of Issaquah owns a series of small dams that it built to keep the culvert from getting plugged with sediment. Those will have to be taken out. Beyond that, though, is a barrier culvert on private property that allows a driveway to pass over the seasonal stream. Issaquah has said it would consider removing its dams. But except where it can reach agreements with owners who have culverts directly abutting state roads, the state can't really do anything about blocked culverts farther upstream on private property. "A culvert like that, maybe people would say, 'Let's just put a bigger pipe in there and make it passable as part of the project.' That would be a pretty small part," Wagner said. "But the bottom line is, it's not our responsibility to fix it. And we can also say, 'Hey, we're doing our part, somebody else has to do their part.'" In Issaquah, Washington DOT last fall wrapped up a $7 million, three-year project to fix two culverts that pass under an intersection. Fixing the culverts required widening them and returning the stream to its natural, meandering state. The state laid tree trunks, their root wads still attached, on either side of the stream, creating shallow pools for juvenile fish. On a recent April day, a newly hatched salmon was swimming in one such pool. Trees planted along the banks, including willows and cottonwoods, will grow a few feet by the end of the year, providing shade. Other projects sometimes require leveling out the gradient of the channel, especially in cases where fast-moving water has scoured out the bottom of the streambed. New culverts are built to withstand 10-year floods, according to Martin Fox, a biologist for the Muckleshoot Indian Tribe. "The thing about culverts is, it's something we can do," Fox said. "We can't change climate very readily, we can't fix a lot of the industrialization of our watersheds, but culverts is something where we can go in and pull those things out, correct them, put in a fish passable structure, and immediately you have access to these habitats and your production will be increased." Together, the state wildlife, natural resources and state park agencies had fewer than 100 culverts to repair. But the state DOT owns 978 culverts that applied to the injunction, with 806 deemed to have significant habitat, according to the most recent inventory information. Since the injunction, DOT has so far corrected 55 culverts within the case area, Wagner said. On average, the state says it cost $2.3 million in 2016 and $3.4 million in 2017 to fix a blocked culvert. The cost is going up because the projects that are left are bigger and more complex, according to Wagner. At least one project, in an estuarine area on the Olympic Peninsula where Chico Creek feeds into Puget Sound, is expected to cost more than $40 million because it will require rebuilding a whole highway interchange. "Since we've been working on this for a while, we've kind of gotten a lot of the low-hanging fruit," Wagner said. "With the standards that we have from the injunction, we're basically in almost every case tearing out an existing culvert and putting in a new one. And in a lot of cases, that's a major construction project." In 2017 to 2019, the state DOT plans to spend $97.5 million on stand-alone fish passage projects. The department expects it will need at least twice that amount from the Legislature in its biennial budget. Along with building new culverts, the state is also monitoring repaired ones. 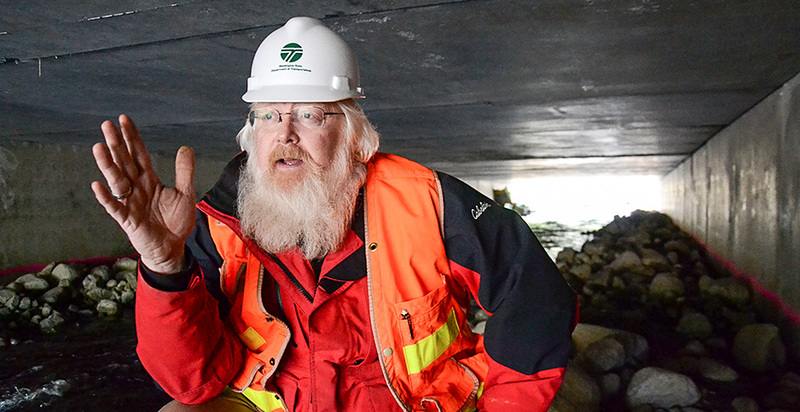 Each year, the Department of Fish and Wildlife inventories about 10 percent of the culverts in the case area, according to Tom Jameson, fish passage and screening division manager in the department's habitat program. "Say you've put in a great stream simulation culvert, and then there's a 50-year rainstorm in this one watershed and they get a bunch of erosion and that culvert gets blown out. Well, now you've got to correct it," he said. The federal government and tribes, though, have accused the state of overstating the cost and complexity of the injunction. Lawyers for the tribes say that the state is basing its cost projection on repairing every blocked culvert on its roads in the case area, rather than culverts that represent 90 percent of blocked habitat. The tribes also say Washington state is making too big a deal of the 9th Circuit's statements about a "moderate living" and that they've never pushed the issue in the culverts case. "You read a lot about it, but it's all fluff from the attorney general," said Mason Morisset, an attorney for the Tulalip Tribes. The federal government argues it "would make little sense" to interpret the treaties as "protecting the tribes' access to their traditional fisheries, yet permitting obstructions that substantially degraded those same fisheries." The Department of Justice attorneys have also pushed back on the state's claims that the federal government shares the blame. The state, DOJ says, was never required to use a particular model of culvert or was prevented from making adjustments to take account of local conditions. Both sides have allies going into tomorrow's arguments. The National Congress of American Indians, other tribal groups, a coalition of current and former Washington officials, former Republican Washington Gov. Daniel Evans (R) — who was governor during the time of the Boldt decision — and fishermen's associations have all filed amicus briefs in support of the tribes and the U.S. government. A group of law professors is also backing the tribes, arguing that, aside from the treaties, there's a common-law tradition against blocking fish passage and obstructing waterways. Washington's allies in the Supreme Court include a coalition of states, business and industry groups, conservative legal foundations and an irrigation district. Led by Idaho, a group of 11 states said in an amicus brief on behalf of Washington that they're worried about how broadly tribal rights will be read within their borders if the 9th Circuit decision is upheld. They warned that EPA's recent decision to impose federal water quality standards in Maine and Washington where it deemed subsistence fishing or sustenance rights exist is a "harbinger" of things to come. The Washington State Association of Counties and the Association of Washington Cities say they're also worried that the tribes may go after their infrastructure next if they win the court case. 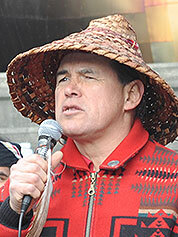 But Brian Cladoosby, chairman of the Swinomish Indian Tribal Community, slammed the state and its allies for "citing the worst-case scenario." "Fear is a great motivator," he said. "I can tell you from Swinomish's perspective, that we've never sat around the table and said, 'What's next?' Our focus has been 100 percent on winning a culvert case only. We've never said, 'OK, we've got these damn dams on the Skagit River that we're going to take down after we win this case." To Cladoosby, who was born and raised on the Swinomish reservation along the Skagit River and whose father's great-grandfather Kelkehltsoot signed the 1855 treaty on behalf of the Swinomish, the state's decision to appeal the Martinez injunction all the way to the Supreme Court is the latest in a long state history of anti-Native American policy and sentiment. "If they started doing the work that we wish they would have done when we filed this lawsuit instead of fighting it, we would be light years ahead of where we are today," he said. Cladoosby said that the tribes "tried very hard" over the last decade to negotiate with the state on the culvert issue. He accused the state of having a "we'd rather fight and lose than settle and win" mentality when it comes to tribal treaty rights. "It's not for a lack of the tribes putting proposals out on the table that we thought were very, very fair," he said. "They walked away from what we put on the table." He added: "Then the Bob Fergusons of the world can go tell their constituents, 'We fought the good fight against the Indian tribes, we gave it our best shot, but the courts ruled against us.' They always have that excuse, that the courts ruled against us." But the state also contends it tried its best to settle the litigation. The attorney general's office retained Special Assistant Attorney General Rob Costello, who has served as tribal liaison for prior administrations, to negotiate with the tribes. "We have worked hard to reach a resolution in this case outside of court," Ferguson said in a statement. "To that end, I have personally met with tribal leaders three times in an effort to reach agreement. While we made progress, we have not reached a mutually acceptable resolution." Still, the people at state agencies charged with carrying out the injunction and tribal members have continued meeting. Agencies involve the tribes in project-level decisions and in broader talks to hammer out the details of the seven-page court injunction, said Jameson of the Department of Fish and Wildlife. "There's two ways to resolve the gray area. One is like the decision directs — we're encouraged to work together with the tribes to implement the injunction," Jameson said. "The way is, OK, we don't get along, so the tribes' only recourse would be to go back to Martinez and say, 'The state's not implementing this correctly, they won't talk to us, we can't get along, we need you to help us.' That's inefficient." If the state wins at the Supreme Court, the Washington DOT would likely go back to its former system of prioritizing culvert projects. It placed more emphasis on the quality of habitat, rather than focusing on culverts with 200 lineal miles or more of upstream habitat. "With the injunction, you can have miles and miles of degraded habitat, but you're still required to open it up," said Kanzler, DOT's stream restoration program manager. But tribes say they are worried that if the injunction goes away, the culverts will continue to be formidable obstacles for spawning and juvenile salmon. When the tribes first brought their case in the 1970s, they made up less than 5 percent of the annual salmon harvest. Now, thanks to the successive court decisions, their share is 50 percent. But they're catching fewer fish now than they did in the 1970s. "I used to be able to be able to live an entire year off what I did in fishing for anywhere from 36 to 48 days out of the year. I used to be able to live the entire year off of that," Hamilton of the Muckleshoot Indian Tribe said. "Now, we're lucky if we're fishing 20 days total. I mean, some fisheries are down to hours." Like Krise, the Squaxin Island Tribal member, Hamilton grew up fishing in local streams to provide salmon for his family's smokehouse. He stopped fishing commercially in 1995. "I took my boat out back — I had a 26-foot gill netter — brought in a bulldozer, dug a big hole, pushed it in and crushed it up. It was no longer economically feasible," he said. When Hamilton stopped, he began to work on fishing policy full-time. "We're fishing people," Hamilton said. "Even though we have casinos, we have a majority of people that don't work, that will never work in [casinos], because fishing — it's what they do. ... Everything we do revolves around the water and the salmon." For the tribes, Krise said, the case is about more than just restoring habitat. "Salmon to our tribal people — it's not only the body, mind, soul, spirit. It's infant, child, adult, elder. It's spring, summer, fall, winter. It's who we are as a people," she said. 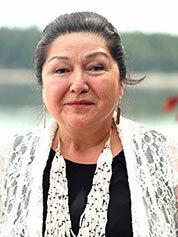 She hopes that the tribes and state can one day work together to protect the area's natural resources. "The hope is that the Supreme Court will also recognize that there's a different type of value," Krise said. "Maybe Washington state is worried about the expenditure of having to do these culverts; however, there are some of us that worry about the other value that when something is lost it can never be regained again."